Odeon Multicines Girona is the second film theatre in Spain to offer Star Wars: The Force Awakens in 3D using a Christie dual-head 6-Primary (6P) laser projection system. This multiscreen complex joins a growing band worldwide to offer Christie 6P laser projections. Sala 4 at the multiscreen complex, which already had Dolby Atmos sound, was equipped for the occasion with the Christie CP42LH HFR 3DLP 4K RGB laser projector, an ultra-bright colorful solution for big screens. Anchored by the Christie Freedom laser lighting system, the CP42LH reproduces a color spectrum that exceeds DCI P3 specifications and matches the Rec. 2020 color space, making it the most advanced RGB laser cinema projection system available on the market. Located in Espai Gironès, a huge shopping centre in Salt, a town just outside Girona, Multicines Odeon has ten screens with a total capacity of 1,700. Seating 277 people, Sala 4, where the dual-head Christie system has been installed, is the theatre’s main screen, measuring 14.3 meters wide and 6.1 meters high. The theater is also equipped with Dolby Atmos sound. The system installed in this theatre includes two 4K Christie CP42LH laser projection heads with integrated media block (IMB) connected via fibre optic to two racks, each one with six RGB laser modules that provide a total of 60,000 lumens – double what current digital projectors with lamps are able to offer. The scalability of the platform allows up to 12 modules per rack. And with each laser module generating 5,000 lumens of light, a potential of up to 60,000 lumens per rack, and a total of 120,000 lumens is possible. The system, designed to achieve over 14 foot lamberts in 3D screens, uses Dolby3D glasses specifically engineered to exactly match the six primary laser light wavelengths, thus yielding very high light efficiency. The 6P laser projection screening of Star Wars at Odeon Girona has been the talk of this town and its 97,000 inhabitants.“You can hear people coming out saying that they haven’t seen anything like it. The word of mouth alone is bringing in the crowds. And that is a source of pride for us, because the audiences here in Girona are very demanding and appreciate the high quality,” Millán said. Odeon Multicines Girona is now the second film theatre in Spain to offer Star Wars: The Force Awakens with a dual-head 6P laser projection system, following in the footsteps of Dolby Cinema La Maquinista in Barcelona which is equipped with the Dolby Vision projection system. 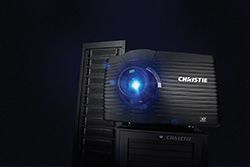 Christie worked closely with Dolby in co-developing the new proprietary HDR and wider color gamut technology that leverages customized, high-frame-rate (HFR) capable Christie 4K laser projection heads to deliver the unparalleled visual excellence of Dolby Vision.